Want to travel like a local and save a few quid? Here is how you can go to the number 1 tourist attraction in Northern Ireland by public transport. Although possible, it is quite a lot of hassles. Checked on Irish Rail‘s site. It is €38 for adult single and €40 for a day return. €19.99 for adult single, €10.00 for child single. No day return specials. (ii) Aircoach seems to be a cheaper option. has Adult Single ticket for €11.00 / £8.80. Return ticket is costing €20.00 / £16.00. For children it is €9.00 / £8.00 for a single ticket and €14.00 / £12.00 for a return ticket. (iii) Translink has a one way ticket from Dublin to Belfast which costs £8 for an adult and £4.80 for a child. I can’t find any day return specials. A return trip is also costing the same. has £8.50 one-way ticket from Belfast to Dublin if you buy online in advance.Bus X1 or Bus X2. You can’t buy it the other way round though (from Dublin to Belfast) as it is a Northern Ireland’s company. You also can’t get this price if you buy from the station/ on the bus. (iiii) Dublin Coach offers a single ticket which costs €10.00 / £8.00. A return trip is also costing the same. From Belfast to Coleraine – Train is £11.50 adult single and £18.50 day return; Bus 218 is £9.00 return*. Then from Coleraine to Giant’s Causeway – Bus 172 / 402 / 402a /252 is £3.50 £4.40 single and £6.30 £7.90 day return if you come back before 9:30 am (This is almost impossible! Unless you were staying in Coleraine the day before and only want to spend less than 1 hour at the Causeway) . *£9.00 return – It is actually the fare for the Bus Rambler Ticket (only available between May and September) which provides unlimited Ulsterbus & Metro Day Travel after 9:15am. All the buses listed above are Ulsterbus. You can take your Bus Rambler Ticket and hop-on to a bus when you are done with the Causeway. They have stops at Carrick-a-Rede Rope Bridge, White Park Bay, Dunluce Castle, Bushmills, Portrush etc. However, keep in mind there are only around 6 buses a day between 11am and 5pm. Deducting the time you actually have to spend at the attraction, you can only see 2 to 3 attractions at most. Saturdays and Sundays are worse as there are only 3 – 4 buses for the whole day. That’s around £25.00 / €30.00 for the day. Sounds good. So what time do I have to start the day? For both the options above, you have to start your day 6:30am in the morning. I know. We all want to sleep in a little bit but there is simply no other way. I have tried searching for a few different dates (weekend/ weekday), but it all comes back with the same result – From Belfast to the Giant’s Causeway, there are only four options a day. Leaving at 9:30am in the morning or 4:00pm in the afternoon. 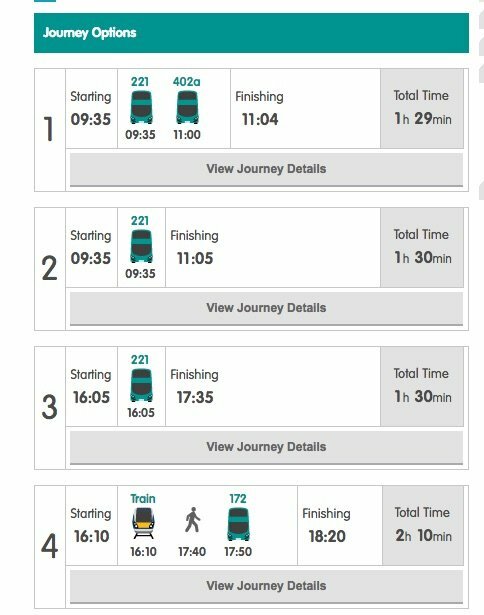 Obviously the two 4pm options are too late so you only have 1 option – leaving Belfast 9:30am. See below a screenshot from translink’s journey planner. It wasn’t like that last year. I am not sure if they have forgotten to update their timetable online or actually changed the whole thing. Taking public transport is around €15 – €20 cheaper than joining a guided tour. Is it worth it though? – Every time when you have to change a bus, you will have to look for the new bus stop. Running around the city sounds fun…? – What if there is traffic and it looks like you are going to miss the connecting bus? What’s the plan B here…? – And what about when you actually miss the bus? – Bus strike? In 2016, we had almost 20 days (mostly weekends) in Dublin that buses were not running due to bus strike. Who knows what’s going to happen next? Booking a guide tour is slightly more expensive but definitely has its advantages. P.S. All the information above is based on my checks on their websites on 16 Aug 2016. 24 July 2017. *The views and opinions expressed in this article are those of the authors and do not necessarily reflect the views or opinions of Finn McCools Tours. If you would like to like us to publish your article, send us an email!